The SYNTAX SPK Series is an uber heavy duty, top quality industrial-grade connector for true professional performance speakers. 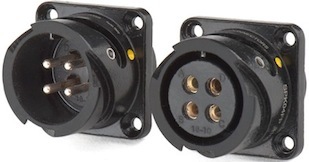 Utilized where low budget plastic connectors are simply unacceptable, and where the outmoded design of legacy metal speaker connectors injects electrical risk and potential liability. Original equipment on many top quality, brand name speaker columns. SPK 4, 8 and 19 pin connectors are CA-COM compatible. The SPK 8 pin is used extensively in L-Acoustics installation applications. Quick delivery, typically 2-3 business days. Highly competitive pricing, clever design features and terrific quality. Super service & fast response. Inline and panel versions. Factory installed high quality silver plated machined solder contacts standard. Optional gold plated solder, gold crimp or silver crimp contacts. Available with or without aluminum or rubber coated locking rings. Flawless cataphoresis painted finish, extremely durable and scratch-resistant. Paint layer uniformity provides smoother mating. Other CA-COM pin configurations (5, 6, 7 pins) available by special order. The SYNTAX plastic cable glands used on the SPK Series are designed for perfect grip and effortless spanner tight seal. Glands are constructed of Nylon 6 and feature a neoprene seal for an IP68 5-bar watertight bond. Blade system delivers optimal strain relief and cable protection combined with a wide clamping range. Multiple threads for secure and rapid assembly. 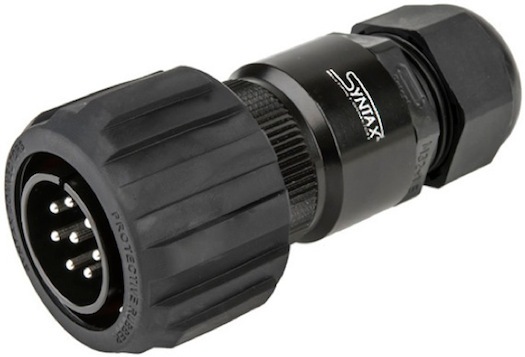 SYNTAX cable glands are designed not to come loose under torsion or vibration. Optional spiral flex strain relief also available. Options on SPK 4, 8 & 19 pin versions include: Ag Solder or Crimp and Au Solder or Crimp contacts. Please contact IOL for pricing and part numbers. The singular SPK008 Adapter cleverly allows two cables with locking rings to be interconnected, instantly creating a extension cord. Time & cost saver. Very handy in the toolkit at the install site; e.g., 93' is needed but only 75' cords are at hand. Male + Female interface available in Ag or Au plated solder installed contacts. CA-COM compatible. SPK008ADIV-SV CA-COM Adapter with male/female interface. Ag solder contacts. No Locking Rings. SPK008ADIV-GD CA-COM Adapter with male/female interface. Au solder contacts. No Locking Rings. Route 16 audio lines from amp or speaker to (2) NL8 plastic or (2) SPK-8 heavy-duty metal speaker connectors. 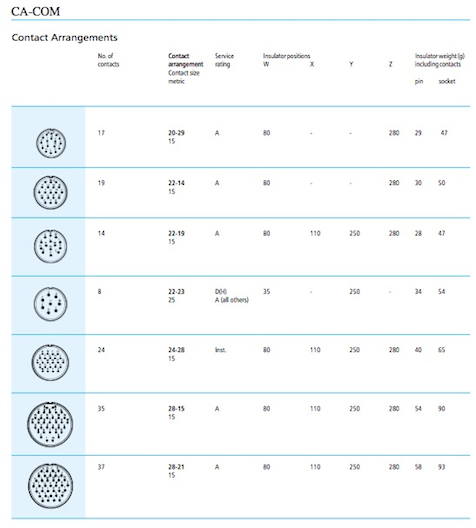 Please contact IOL for pricing and part numbers on SPK 8 pin versions with Au Solder, Au Crimp or Ag Crimp contacts. The SPK 19 features a 22-14 insulator, and is fully CA-COM compatible. Use SVK19 (20A48 insulator) for 19-pin MIL-C-5015 compatibility. Please reference the original VEAM (ITT Cannon) CA-COM pin out guide for larger sizes shown below. Connectors under classifications CA-COM and MIL-C-5015 are not interchangeable/intermateable. 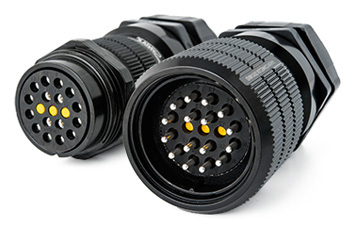 The MIL-C-5015 19 pin connector is often referred to as "PA-COM," whereas the SPK Series is CA-COM.